BRACKNELL, UK. 27th FEBRUARY 2018 – Panasonic today announced at Mobile World Congress the fully rugged Panasonic Toughpad FZ-M1 Thermal Imaging Tablet designed to capture and process images on the move. 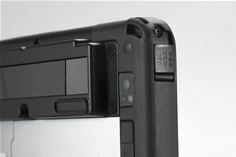 The handy 7-inch tablet equipped with a FLIR Lepton micro thermal camera, is a Windows-based device that allows field workers to take and process accurate thermal images on the spot and link these images to other line of business applications and add metadata content such as QR codes. The thermal imaging application has been designed by Panasonic, drawing on its 20 years experience of providing seamless hardware and software solutions for business customers. With Standard and Pro (additional licence) software options, users can measure thermal high and low points, capture still images or record film and add meta data to images such as QR codes. This additional data functionality enables images to be integrated with multiple line of business applications using the capabilities and connectivity of the Panasonic Toughpad tablet. The FLIR Lepton micro-thermal camera offers 160×120 thermal resolution and has an imaging temperature range of minus 20 degrees up to 400 degrees Celsius, plus or minus five degrees. The Panasonic Toughpad FZ-M1 tablet delivers multi-task, high-performance working capabilities with its Windows 10 Pro operating system and its 6th generation Intel Core or Atom Core processor. For field workers, the device has an 8 hour battery life with 16 hour option and hot swap battery capabilities. The sunlight readable display can be operated with a stylus, by touchscreen and when wearing gloves. With its flexible customisation options, the device can be configured with Barcode reader, Serial port, 4G and Smartcard as required. Its fully rugged and fanless design means it is drop resistant to 180cm and IP65 rated, yet compact and lightweight enough to fit into the pocket. The Panasonic Toughpad FZ-M1 Thermal Imaging solution will be available from end of February 2018. The thermal camera option will be available later in the year on other products.